At Fifthroom.com, we are always encouraging people to get “ahead of the curve” when it comes to a major addition on your property, with structures like gazebos, pergolas or ramadas. It can take a bit of time for you to decide what size, style and material you’ll want to use and that’s not something you rush into. So please, call our online Professional Consultants (based at our U.S. headquarters, not in some call center…) who will help you with every aspect of planning and building, including how to get your new structure shipped and installed. And, to make it even easier, layaway is available, too! If you already have an outdoor living space, such as a porch, patio, pool or lanai, you may want to plan ahead to upgrade or replace the furniture that’ll be back out once the temps start to rise. Was your furniture starting to look worn out last year? Do you have a special event coming up this summer and want to make it special? Browse our many options, which include cedar, teak and poly lunber furniture, as well as comfy “deep seating” sets in many colors and fabrics. Most of these are on sale now AND include free shipping. 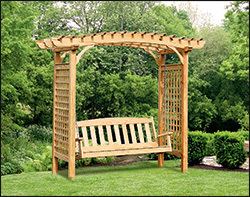 So, now you have a new pergola, a beautiful new set of patio furniture – but – something’s missing, is it? Yep! All those glorious add-ons that make your yard special and unique to you and your family. We’re talking about a bird feeder for the garden, a fire pit for those cool evenings, maybe a cedar arbor to form a stunning entranceway to your back yard, or a potting bench to help make planting easier on your back. At Fithroom.com, we’ve got all that and so much more. Spring IS coming. Let us help you plan for it NOW!